Note that he is the father-in-law of Ralph Fowler. Rutherford had a DSc (1900) from the University of New Zealand. Ernest Rutherford, 1st Baron Rutherford of Nelson OM PC FRS (August 30, 1871 - October 19, 1937), widely referred to as Lord Rutherford, was a nuclear physicist who became known as the "father" of nuclear physics. His major contribution was to prove that all the positive charge in the atomic nucleus was contained in a volume 1/100,000 the size of the atom. He pioneered the orbital theory of the atom through his discovery of Rutherford scattering of alpha particles off the nucleus with his gold foil experiment. 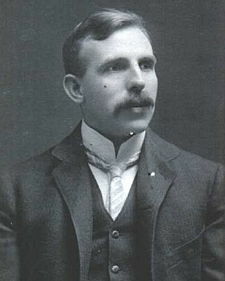 Ernest Rutherford was the son of James Rutherford, a farmer who had emigrated from Perth, Scotland, and his wife, Martha (née Thompson), originally of Hornchurch, Essex, England. His parents had moved to New Zealand "to raise a little flax and a lot of children." 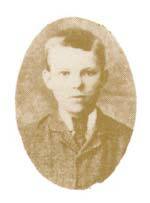 Ernest was born at Spring Grove (now Brightwater), near Nelson, New Zealand. His name was mistakenly spelled "Earnest Rutherford" when his birth was registered. He studied at Havelock and then Nelson College and won a scholarship to study at Canterbury College, University of New Zealand, where he was president of the debating society, among other things. In 1895, after gaining his BA, MA, and BSc, and doing two years of research at the forefront of electrical technology, Rutherford traveled to England for postgraduate study at the Cavendish Laboratory, University of Cambridge (1895-1898), and he briefly held the world record for the distance over which electromagnetic waves could be detected. During the investigation of radioactivity, he coined the terms alpha and beta to describe the two distinct types of radiation emitted by thorium and uranium. In 1898, Rutherford was appointed to the chair of physics at McGill University in Montreal, Canada, where he did the work which gained him the 1908 Nobel Prize in Chemistry. From 1900 till 1903, he was joined by the young Frederick Soddy (Nobel Prize 1921) where they collaborated on research into the transmutation of elements. Ernest Rutherford had demonstrated that radioactivity was the spontaneous disintegration of atoms. He noticed that a sample of radioactive material invariably took the same amount of time for half the sample to decay—its "half-life"—and created a practical application for this phenomenon using this constant rate of decay as a clock, which could then be used to help determine the actual age of the Earth, which turned out to be much older than most scientists at the time believed. In 1907, Rutherford took the chair of physics at the University of Manchester. There, he did the experiments along with Hans Geiger and Ernest Marsden (Geiger-Marsden experiment) that discovered the nuclear nature of atoms. It was his interpretation of this experiment that led him to the Rutherford model of the atom, having a very small positively charged nucleus orbited by electrons. He became the first person to transmute one element into another when he converted nitrogen into oxygen. In 1921, while working with Niels Bohr (who postulated that electrons moved in specific orbits), Rutherford theorized about the existence of neutrons, which could somehow compensate for the repelling effect of the positive charges of protons by causing an attractive nuclear force and thus keeping the nuclei from breaking apart. Rutherford's theory of neutrons was later proved in 1932, by his associate James Chadwick who was awarded the Nobel Prize in physics for his discovery in 1935. Rutherford was knighted in 1914. In 1917, he returned to the Cavendish as Director. Under him, Nobel Prizes were awarded to Chadwick for discovering the neutron (in 1932), John Cockcroft and Ernest Walton for splitting the atom using a particle accelerator, and Appleton for demonstrating the existence of the ionosphere. He was admitted to the Order of Merit in 1925, and in 1931, was created Baron Rutherford of Nelson, of Cambridge in the County of Cambridge, a title that became extinct upon his unexpected death in a hospital following a hernia operation. A stylized representation of the Rutherford model of an atom, with the positive center 1/10,000 the size of the electron sphere. The Rutherford model was a model of the atom devised by Ernest Rutherford. He performed his famous Geiger-Marsden experiment (1909), which showed that the Plum pudding model (of J.J. Thomson) of the atom was incorrect. Rutherford's new model for the atom had a number of essential modern features, including a relatively high central charge concentrated into a very small volume in comparison to the rest of the atom. In the Geiger-Marsden experiment which Rutherford directed, alpha particles were used as a probe into atomic structure by being allowed to pass through a thin piece of gold foil, then detected. Rutherford predicted that all of the particles would pass through the foil, or be deflected slightly. This is what happened most of the time, but a small proportion of particles (about 1 in 8000) bounced unexpectedly nearly straight back toward the source. This supported the hypothesis that atoms have a dense region containing most of their mass, and associated with a highly concentrated electric field (probably positive in nature), instead of spread-out positive or negative field. Rutherford thought it likely, on purely symmetric and aesthetic grounds, that such a region of dense charge and mass would be located in the atom's center. Such a region "would then form a sort of atomic core." For concreteness, consider the passage of a high speed a particle through an atom having a positive central charge N e, and surrounded by a compensating charge of N electrons. From purely energetic considerations of how far alpha particles of known speed would be able to penetrate toward a central charge of 100 e, Rutherford was able to calculate that the radius of his gold central charge would need to be less (how much less could not be told) than 3.4 x 10-14 meters. This was in a gold atom known to be 10-8 meters or so in radius—a very surprising finding, as it implied a strong central charge less than 1/3000th of the diameter of the atom. The Rutherford model did not attribute any structure to the orbits of the electrons themselves, though it did mention atomic model of Hantaro Nagaoka, in which the electrons are arranged in a ring (this is the only previous atomic model mentioned in the 1911 paper). The Rutherford paper suggested that the central charge of an atom might be "proportional" to its atomic mass in hydrogen mass units (roughly 1/2 of it, in Rutherford's model). For gold, this mass number is 197 (not then known to great accuracy) and was therefore modeled by Rutherford to be possibly 196. However, Rutherford did not attempt to make the direct connection of central charge to atomic number, since gold's place on the periodic table was known to be about 79, and Rutherford's more tentative model for the structure of the gold nucleus was 49 helium nuclei, which would have given it a mass of 196 and charge of 98. This differed enough from gold's "atomic number" (at that time merely its place number in the periodic table) that Rutherford did not formally suggest the two numbers might be exactly the same. The Rutherford model of the atom was soon superseded by the Bohr model, which used some of the early quantum mechanical results to give locational structure to the behavior of the orbiting electrons, confining them to certain circular (and later elliptical) planar orbits. In the Bohr model, expanding on the work of Henry Moseley, the central charge was identified as being directly connected with the atomic number (that is, the element's place on the periodic table). Since the Bohr model is an improvement on the Rutherford model in this and other ways, some sources combine the two, referring to the Bohr model as the Rutherford-Bohr model. However, even an atom with a core containing an atomic number of charges was the work of a number of men, including those mentioned, and also lesser known workers, such as Antonius Van den Broek. The Rutherford model was important because it essentially proposed the concept of the nucleus, although this word is not used in the paper. What Rutherford notes as the (probable) concomitant of this result is a "concentrated central charge" in the atom: "Considering the evidence as a whole, it seems simplest to suppose that the atom contains a central charge distributed through a very small volume, and that the large single deflections are due to the central charge as a whole, and not to its constituents." The central charge containing most of the atom's positive charge, invariably later become associated with a concrete structure, the atomic nucleus. After the Rutherford model and its confirmation in the experiments of Henry Moseley and its theoretical description in the Bohr model of the atom, the study of the atom branched into two separate fields, nuclear physics, which studies the nucleus of the atom, and atomic physics which studies the atom's electronic structure. His main contribution to the development of modern science was the basic structure of the atom: A very small positive nucleus surrounded by a cloud of electron 100,000 times larger. His scattering experiments, which established this fact, are still the basis of much of high-energy physics. His research, along with that of his protege, Sir Mark Oliphant was instrumental in the convening of the Manhattan Project to develop the first nuclear weapons. He is famously quoted as saying, "In science there is only physics; all the rest is stamp collecting." He is also reputed to have stated that the idea of using nuclear reaction to generate useful power was "moonshine." A student hall at Loughborough University. A lecture theater at the University of Manchester. Rutherford was the subject of a play by Stuart Hoar. Rochester and Rutherford Hall a boarding house at the University of Canterbury, Christchurch, New Zealand. Rutherford Appleton Laboratory a UK scientific research laboratory near Abingdon in Oxfordshire. Rutherford Close a residential street in Abingdon in Oxfordshire. 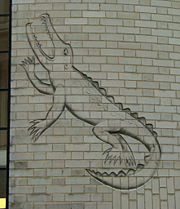 On the side of the Mond Laboratory at the site of the original Cavendish Laboratory in Cambridge, there is an engraving in Rutherford's memory in the form of a crocodile, this being the nickname given to him by its commissioner, Rutherford's colleague Peter Kapitza. The initials of the engraver, Eric Gill, are visible within the mouth. Rutherford was known as "the crocodile." Engraving by Eric Gill at the original Cavendish site in Cambridge. ↑ An Encyclopedia of New Zealand, Ernest Rutherford. Retrieved May 13, 2007. ↑ John Campbell, Rutherford, Ernest 1871-1937. Retrieved April 17, 2008. ↑ Think Exist, Rutherford Quotes. Retrieved April 17, 2008. ↑ pubs.acs.org, ACS Article on Rutherfordium. Retrieved April 17, 2008. Campbell, John. Rutherford: A Biography. Retrieved October 6, 2007. Nobel Prize. The Nobel Prize in Chemistry, 1908. Retrieved October 6, 2007. Rutherford.org. Homepage. Retrieved October 6, 2007. All links retrieved August 17, 2017. Nobel Lecture The Chemical Nature of the Alpha Particles from Radioactive Substances from Nobelprize.org website. Biography Biography from Nobelprize.org website. "Ernest Rutherford 1871 - 1937." A Science Odyssey, pbs.org. Annotated bibliography for Ernest Rutherford from the Alsos Digital Library for Nuclear Issues. Rutherford at Canterbury University College. The Rutherford Journal. This page was last modified on 17 August 2017, at 14:15.